Taranaki, New Zealand, is a region of unlimited potential. From picture-perfect Mount Taranaki to the wild surf beaches and civilised cultural attractions, the region boasts a natural energy and vibrancy. The Taranaki lifestyle has become the stuff of legend. The region is known as the energy province of New Zealand, as much for the rich mineral resources underneath it as the energised landscape and welcoming locals who reside there. At its heart – both geographically and spiritually – stands Mount Taranaki, a natural playground and proud regional icon. While nestled on the coast, the progressive capital city of the region – New Plymouth, was judged New Zealand’s Top Town by influential North & South magazine. In Taranaki it’s easy to achieve an enviable lifestyle, without having to compromise your career. The region’s dynamic surf, masses of parks and gardens, iconic walkways, major events calendar and mountain playground make it a great place to live. Add to that the minimal traffic, high employment and clean air and water, and you’ll soon see why this safe and stimulating community is the perfect place to call home – whether you’re seeking a better lifestyle, starting a family, or simply looking for a change. New Plymouth, the city by the sea, was voted the most liveable and sustainable community in the world at the 2008 UN-backed Liveable Communities awards. Taranaki is home to 107,500 people, most of who live in the coastal city of New Plymouth. The region is split into three districts: New Plymouth to the north with a population of about 70,000; Stratford in central Taranaki servicing about 9,000 people; and South Taranaki; including the main centre of Hawera, with a population of 26,000. The Taranaki Regional Council covers the entire region, providing services and information on the environment, resource consents, public transport, and civil defence. Taranaki’s infrastructure and amenities are of a high standard and impressive for a region of its size. They include numerous libraries, town halls, art galleries, sports facilities and swimming pools, cycle and walk ways, museums, car parks, parks and reserves, theatres and stadiums, which are located throughout the region. Taranaki’s economy has been a strong performer over the last decade and is forecast to grow faster than the national economy over the next 20 years. The province has been largely insulated from global fluctuations by the strong natural and physical resources of the region’s two cornerstone industries, black gold – oil and gas – and white gold – dairy and food production. 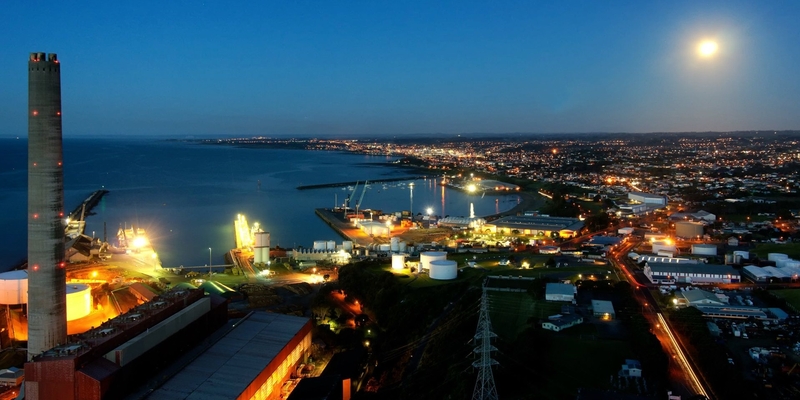 Taranaki is the centre of New Zealand’s oil, natural gas and petrochemical industries with all of New Zealand’s producing oil and gas fields being located onshore and offshore in the Taranaki Basin. The sector is extremely buoyant and supports a range of ancillary industries, including niche engineering, manufacturing, planning and design that form part of an extensive supply chain Venture Taranaki Trust, the Regional Development Agency, offers a range of tools and services to help businesses from inception through to global expansion. The region’s robust dairy industry is also an important part of Taranaki’s economy with almost four billion litres of milk processed annually. Ensuring the milk keeps flowing is a strong rural support sector, spanning everything from pasture and herd management to the processing and exporting of associated dairy products and technologies. Agriculture production produces 9.5 percent of the region’s GDP, while food processing (mostly dairy and meat) contributes a further 9.9 percent. Taranaki’s pioneering spirit is legendary and the region’s businesses have grown from these core industries into a diverse range of sectors, gaining an enviable reputation for innovation along the way. Today, Taranaki does everything, from crafting some of the best superyachts in the world to developing cutting-edge technologies for the earthmoving industry or manufacturing hotcakes for the global market. Taranaki offers a wide variety of affordable housing ranging from apartment living in city and town centres, traditional bungalows on private sections to farms and lifestyle blocks in the countryside. With the affordability of housing in the region, along with the time you’ll save in commuting, Taranaki gives you lifestyle choices ‘like no other’. With a spacious, safe living environment, Taranaki is a great place to call home. If you would like to find somewhere to live, contact a Taranaki Harcourts agent. If you choose to make New Plymouth your home, no matter what suburb you live in, you will be just minutes away from the city centre. It’s likely to take you no more than 10 minutes to commute to work each day.